A coral colony is made up of numerous individual coral polyps. Corals use their tentacles to feed on zooplankton, but depend primarily on microscopic, algae known as zooxanthellae located inside their tissues to provide them with food. Corals are very dependent on this symbiotic relationship, receiving up to 90% of their energy from the zooxanthellae. Healthy corals usually appear tan, brown or green from the presence of the algae within their tissues. Some types of corals have additional pigments so may appear more blue or purple. Coral bleaching is a stress response that occurs when the coral-algae symbiotic relationship breaks down. The term “bleaching’ describes the loss of color that results when zooxanthellae are expelled from the coral polyps or when chlorophyll within the algae are degraded. 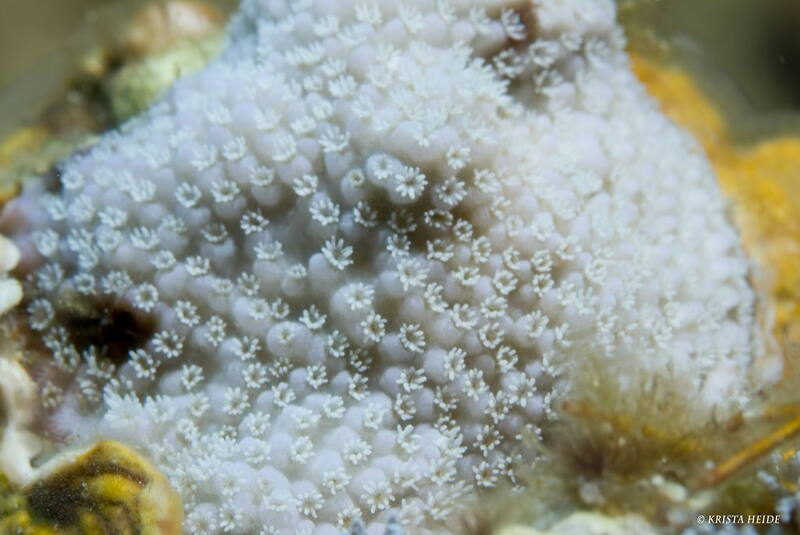 When the zooxanthellae leave the coral, the white of the coral skeleton is then clearly visible through the transparent coral tissue, making the coral appear bright white or ‘bleached’. Some corals, such as our lobe coral, have additional pigments in their tissue, so when they ‘bleach’ they may turn a pastel shade of yellow, blue or pink rather than bright white. Bleached red rice coral (Montipora capitata). Note that the coral polyps are present but pure white from loss of zooxanthellae. Coral bleaching can be caused by a wide range of environmental stressors such as pollution, oil spills, increased sedimentation, changes in salinity, low oxygen, or disease. However, the primary cause of mass coral bleaching is increased sea temperatures. Corals are very sensitive animals so water temperatures need only increase 1-2 degrees Celsius above normal levels for bleaching to occur. The corals are still alive after bleaching but begin to starve. Most corals struggle to survive without their zooxanthellae. If the stressful conditions return to normal rather quickly, the corals can regain or regrow their zooxanthellae and survive. If the stressors are prolonged, the corals are more susceptible to disease, predation, and death because they are without an important energy source. Not all corals are equally susceptible to bleaching. Fast-growing branching and plate corals are often the first to bleach and are more likely to die from bleaching. Slower growing massive corals usually take longer to bleach and tend to be able to survive for longer in the bleached state. Localized coral bleaching has been recorded for over 100 years but only in the last 20 years have we seen mass coral bleaching events. Mass bleaching has now affected every reef region in the world. A particularly severe worldwide bleaching event occurred in 1998, effectively destroying 16 percent of the world’s reefs. When coral bleaching causes extensive death of corals, recovery is very slow and dependent on new, young corals (called recruits) settling and growing on the reef. Regrowth of reefs that have been severely damaged by bleaching may take decades. Recovery is especially difficult for reefs in locations suffering from other stresses such as pollution, overfishing or other chronic pressures. Coral bleaching is predicted to occur much more frequently due to higher sea temperatures associated with global climate change. Human populations continue to grow placing more and more stress on the coral reefs. The time to protect our reefs is NOW before these valuable resources are lost forever.